To claim this profile, please confirm you are Mia Bettis. To follow this profile, please let us know your relationship to Mia Bettis. RESULTLoss Girls varsity basketball vs. Montrose. The Battle Mountain varsity basketball team lost Friday's neutral playoff game against Montrose (CO) by a score of 38-23. The Battle Mountain varsity basketball team won Tuesday's neutral playoff game against Harrison (Colorado Springs, CO) by a score of 51-48. RESULTWin Girls varsity basketball vs. Rifle. The Battle Mountain varsity basketball team won Friday's home conference game against Rifle (CO) by a score of 45-28. Girls JV basketball vs. Rifle. RESULTWin Girls varsity basketball vs. Glenwood Springs. The Battle Mountain varsity basketball team won Tuesday's home conference game against Glenwood Springs (CO) by a score of 50-45. Girls JV basketball vs. Glenwood Springs. RESULTLoss Girls varsity basketball @ Palisade. The Battle Mountain varsity basketball team lost Saturday's away conference game against Palisade (CO) by a score of 43-25. Girls JV basketball @ Palisade. RESULTWin Girls varsity basketball @ Steamboat Springs. The Battle Mountain varsity basketball team won Wednesday's away conference game against Steamboat Springs (CO) by a score of 47-36. Mia's basketball stats have been updated for the win vs. Steamboat Springs. RESULTWin Girls varsity basketball vs. Steamboat Springs. The Battle Mountain varsity basketball team won Tuesday's home conference game against Steamboat Springs (CO) by a score of 60-39. Girls JV basketball vs. Steamboat Springs. The Battle Mountain varsity basketball team won Friday's away conference game against Summit (Frisco, CO) by a score of 57-22. Girls JV basketball @ Summit. RESULTWin Girls varsity basketball vs. Eagle Valley. The Battle Mountain varsity basketball team won Tuesday's home conference game against rival school Eagle Valley (Gypsum, CO) by a score of 71-56. Girls JV basketball vs. Eagle Valley. Mia's basketball stats have been updated for the loss @ Rifle. RESULTLoss Girls varsity basketball @ Rifle. 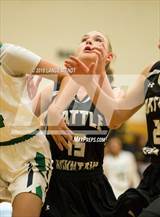 The Battle Mountain varsity basketball team lost Saturday's away conference game against Rifle (CO) by a score of 40-39. Girls JV basketball @ Rifle.